Cirlock presents the SLP-250/240 series of tamper evident security padlocks made specifically for packing and sealing sensitive goods in packs, bags or containers of any size. 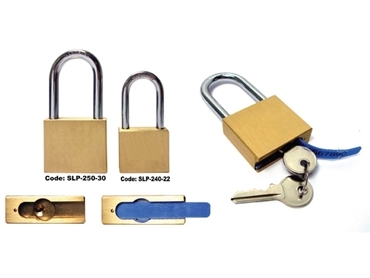 Cirlock’s SLP-250/240 series tamper evident security padlocks are ideal for applications including transport of valuables, medicals, weapons and documents where any breakage or tampering must be known. A special uniquely pre-numbered perforated plastic keyhole cover is inserted in the lock before snap-locking it, preventing access to the keyhole. The keyhole cover can only be removed by destroying it. The keyhole cover number can be recorded for reference, and a replacement cover can only be inserted by unlocking the padlock with its key. The patent pending security padlocks are very secure and impossible to bypass undetected, as breach of seal will always be evident. Cirlock’s SLP-250/240 series tamper evident security padlocks are available through local electrical and other wholesalers or from Cirlock.